I am really looking forward to the professional cycling season kick off (technically the season began at the Tour Down Under in January, not to mention the twenty other professional races that have been run everywhere from Oman to Portugal since then). But for me, the real season doesn’t begin until the Pros line up to start the Omloop Het Nieuwsblad this weekend (professional cycling is great to new fans. Just to keep you guessing, the race is also called the Omloop, Het Volk, and Gent-Gent). This is not to say that the earlier races don’t matter, rather that hierarchy is important in professional cycling and Het Volk is the first race of the year that’s close to the top. Race hierarchy is mostly determined by race’s history (gotta be at least 50 years old, though 100 years is better), length (200km for the small one-day races or tour stages, 300km for the big one-day races) and the course (cobbles, hills or even better cobbled hills). Where does Het Volk sit on spectrum? It was first run in 1945, tick. It is 204km long, tick. 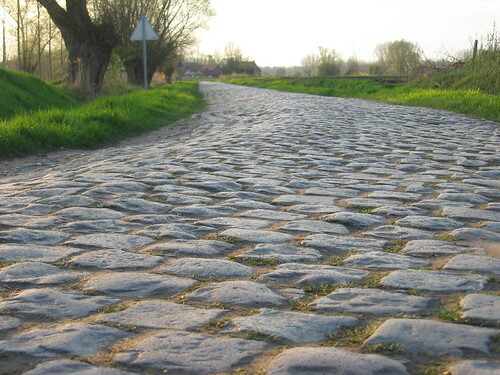 It has a mixture of cobbled and paved climbs, roughly 1km long with gradients nudging 15-20%, tick, tick, tick. Unfortunately, I think I am going to miss watching the race live this weekend. But I will be thinking of all the guys out on the course, and one guy in particular in the commentary box… Phil Liggett. Phil Liggett is cycling’s hot bimbo. He sounds great, but don’t pay too close attention to what he is actually saying. My all-time favorite Liggett quote is in the title (I think it was during the 2004 Tour de France), but another great one is “this is the steepest part of the course and I’m afraid it gets steeper later on”. Priceless. I won’t bore you with too many professional cycling updates on this blog, since there are so many other places that do it better. This is just a little note because I am quite excited, and a final word out to Phil Liggett, don’t go changin’. * I couldn’t find a clip with Liggett commentating at the Het Volk for you 🙁 so I have one of the cobbled climbs instead. I suspect Phil won’t be doing the Het Volk this weekend anyway, as he is currently part of the Channel 9 commentary team that are doing their utmost to ruin the winter olympics for us Aussies. So I hear, bless channel 9! Wouldn’t rule out a transatlantic red eye for our Phil though.